Missouri depends on small businesses to keep its economy thriving – and we need leaders like Josh Hawley in the U.S. Senate to keep Main Street strong and our economy booming. As Attorney General, Josh Hawley fought to protect the constitution – leading the fight against ObamaCare’s crushing taxes and regulations. He knows what it means to stand up for Missouri’s small businesses and middle-class families, and will continue to fight to reduce the burdens of taxes and excessive regulations to keep our economy thriving. Josh Hawley is the leader Missouri needs in the U.S. Senate. On November 6, vote Josh Hawley for U.S. Senate. Josh Hawley is currently serving as the Attorney General of the state of Missouri. He is recognized as one of the nation’s leading constitutional lawyers. He attended Stanford University for his Bachelors’ Degree and Yale Law School. Hawley was a law clerk for Judge Michael W. McConnell of the United States Court of Appeals for the Tenth Circuit. He subsequently served as a law clerk at the Supreme Court of the United States for Chief Justice John Roberts. After his clerkships, he worked as an appellate litigator at Hogan Lovells in Washington D.C. He served as senior counsel to The Becket Fund for Religious Liberty where he litigated First Amendment cases before the U.S. Supreme Court, in the federal circuit courts and state courts of last resort. Hawley was also an associate professor at the University of Missouri Law School where he taught constitutional law, constitutional theory, legislation, and torts.As Attorney General, Hawley joined a lawsuit with 20 other states in seeking the Affordable Care Act declared unconstitutional. Hawley said, the Affordable Care Act “was never constitutional” and supports its repeal. 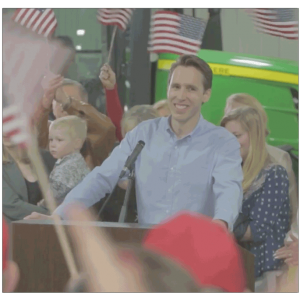 During the campaign, Josh Hawley stated numerous times that he supports the Tax Cuts and Jobs Act and will advocate for its permanency. Hawley also states that amongst his top priorities are eliminating burdensome regulations that hinder growth for small business. If elected, he would be a solid voice for small business and our members in the halls of Congress.